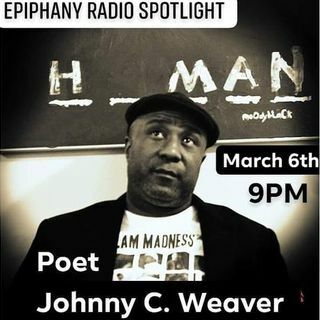 Epiphany RADIO Spotlight featured artist is "Johnny C. Weaver" a spoken word artist from Spartanburg South Carolina who has performed all over the United States. He is the co-founder of Spokenword Spartanburg and Timeless Poetry. He is the founder of Poetry and Conversation Organization that brought diverse individuals together to have genuine conversations about race. He is the founder of Slammadness. A three day bracket style tournament featuring several workshops. "Johnny C. ... Más informaciones Weaver" has been a Slam Coach for several Slam teams. "Johnny C. Weaver" continues to mentor young people through Spoken word. Dial: 319-527-6300 Press 1 to spit a piece!